My azaleas are blooming, and it seems wrong. I live in Savannah, Georgia, which is known for its azaleas. Shrubs which are green and plain at other times of the year transform during azalea season into shocking masses of pink, violet, fuchsia, salmon, and fiery red, so that to look at the bushes, you wouldn’t even know they have leaves. It is only when they bloom that I notice that the azaleas are everywhere: in parks, in medians on city streets, in hedges around schools and libraries and other public buildings, in private yards, and even in vacant lots, framing the ghostly footprint of houses torn down long ago. The transformation of the city into this tapestry of clownish color takes place in March or early April. That timing is part of the azalea’s charm: they welcome the warm weather of spring in a place where no one plants tulips and lilacs because they require several weeks of very cold weather to bloom. In the rest of the city, folks hope for the height of azalea season to take place close to March 17, when over three-quarters of a million people come together here to watch one of the biggest St. Patrick’s Day parades in the country. For me, the best years are when the azalea bloom coincides with a different celebration. The church I serve has a historic cemetery at the center of its property. There are marked graves which date from the early 1800s, and we know there are unmarked graves which are older. Sometime, I believe when the current sanctuary was built about 50 years ago, someone planted a hedge of azalea bushes to delineate the edges of the cemetery. Now, those bushes are almost six feet tall and about as big around. 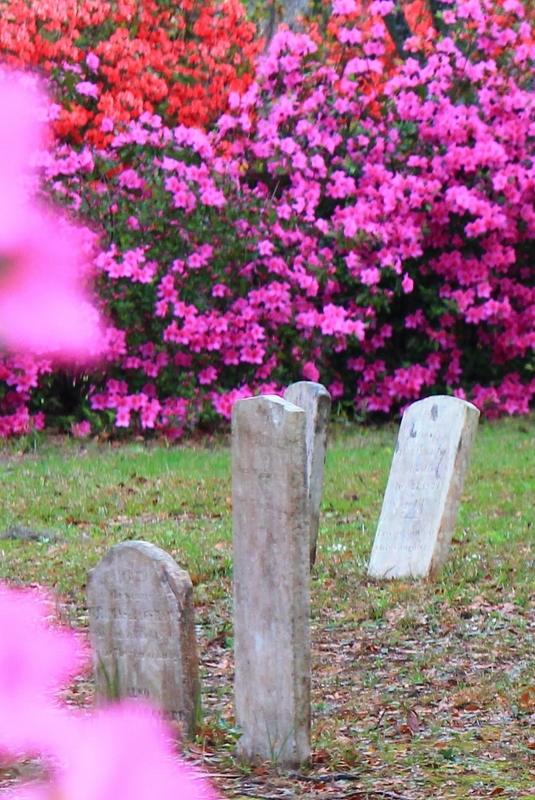 Each year for three or four days, the cemetery glows with the blooming azaleas, offering a backdrop of bright color to the old, crooked stones which mark the graves. And some years, when the weather and the Hebrew calendar align just right, the explosion of the azaleas coincides with the church’s celebration of Good Friday and Easter. When we moved to Savannah, we knew we wanted azaleas in our yard. 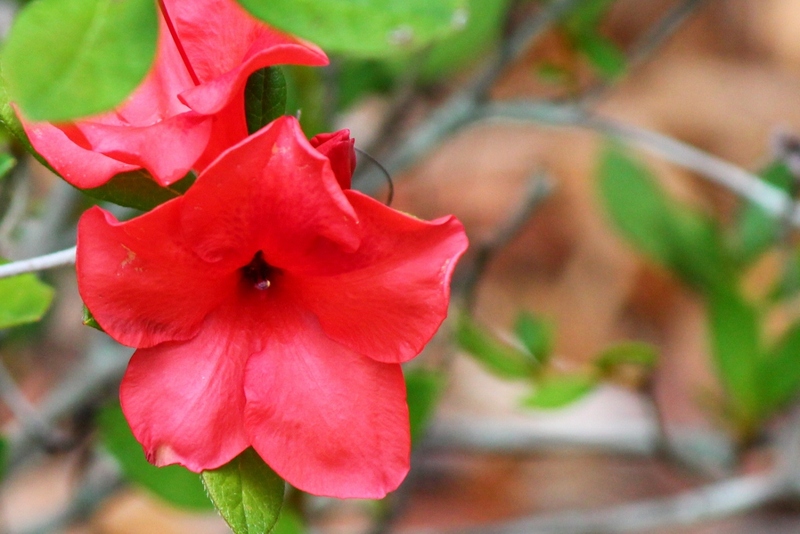 Why would we pass up the chance to have some of that vibrant color surrounding our home? At the nursery where we went to purchase our azaleas, they were promoting Encore azaleas. The tags on the bushes bragged that they would not have only one, all-out show of vivid color each year like the traditional breeds. Instead, they would bloom throughout the year. It sounded like a good idea at the time, and since they were about the only brand of azaleas available at that nursery, we purchased six of them in three different varieties to go in the beds along the front of our house. I really have two problems with the Encore azaleas. The first is that they do not present the spectacle which other azaleas show in the springtime. They are pretty enough, but never with so many blooms that they look like the bush itself will be smothered by them. And the second problem is what I am experiencing now. They are competing with the wide-spreading lantana, the mature hibiscus, the last of the black-eyed susans, and other late-summer bloomers in our garden. The bright, cheery, springtime-is-here proclamation of the azaleas feels like it interrupts the warmer show of the summer flowers. I am ready for days to be getting shorter, not longer. I am ready for the air to start turning crisp, not temperate. I am ready for the leaves to dry out, not to swell in their buds. And I am ready for the tones of autumn, not spring. The blooming azaleas just seem wrong, and if I could do it again, I would be happy with the traditional azaleas which bloom at the proper time and no other. My azalea conundrum makes me think about an elderly woman who came to see me in my office some time back. She wanted to talk with me about what happens after death. She was a smart and faithful woman who knew all of the answers which both the church and popular culture give to that question. But she had always been a bit of a free thinker, and she wasn’t sure that she could believe the images of people floating on clouds, admiring the wings newly attached to their shoulders, hovering around some pearly gates tended by old, white men with long beards. We talked for a few minutes about the variety of images in the Bible for what the future will be: a great banquet, a singing chorus of God’s people, a mansion with many rooms, a city centered around a grand tree, a time when God will wipe every tear from our eyes. We talked about the tension of mystery, and about the stress of not knowing, and about the meaning of fear and hope and trust. And then she finally ask ed me what she really wanted to know: “Pastor, do you ever think about these things? Am I crazy to be wondering like this?” And I said no. I can reference the Biblical images, and I understand that death can happen at any time. But I admitted that I do not really spend a lot of my personal time pondering questions about what I will experience after death. However, I said, the fact that I don’t dwell on those questions myself did not mean she was crazy. It simply meant that she was in a different season of her life than I was in, and with the different season of life came a different season of faith. What was blooming for her at that time was not what added color to my life, and what was in season for me was not the beauty she could discover. Azaleas shouldn’t bloom in the late summer, as we are waiting for the shortening days, the crisp air, the shriveled leaves, and rusty tones of autumn. At the end of our conversation, I felt honored to have participated in it, and I told her so. It was a privilege to listen to her contemplations because they stretched my own imagination about God and faith beyond what is natural for me in this season of my life. What she was contemplating was beautiful. The questions she was asking could reveal the glory of God. And we could both appreciate what she was expressing to me because it was happening for her in its proper season.